If you are one of the select few people who get to witness the birth of kittens, you are in for quite a treat. As long as you’re not too queasy, you can be present during the delivery and be available for your kitty if any complications arise. The most important part of this process is the preparation you do beforehand, beginning near the start of the pregnancy. Let’s go over how to prepare for the birth of kittens – be ready with everything you need during this exciting time! Just like in people, a pregnant cat will benefit from a diet geared for keeping her and the growing kittens well nourished. One of the best ways to ensure she gets the right food at the right time is to track her trimesters. If you are able, mark down when your cat first gets pregnant. During the first two trimesters, you can feed your cat her normal nutrient-rich diet. During the third trimester, you can switch up her food to higher-calorie canned kitten food. This higher-calorie kitten food will help her get enough nutrition when the uterus is pushing up against her stomach – this creates less space for food without discomfort after eating. Keep her on the kitten food until she has fully weaned her kittens. This helps to provide her with adequate amounts of protein and calories during this physically taxing stage of the life cycle. It’s always a good idea to prepare for an emergency situation. At some point during the pregnancy, it is a good idea to visit the vet for a professional overview (and congratulations!). 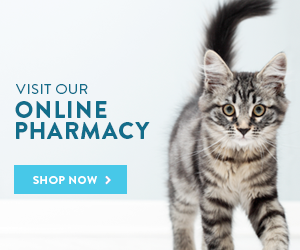 This can help to ensure that your cat is in great shape and so you can get some advice as to what you need to do in the event of a complication (besides immediately visiting the us here at The Little Cat Clinic in La Mesa, CA). Keep some dental floss on hand to tie off a cord in case the mother doesn’t do so. Also, keep some sterile scissors to cut the cord under a similar circumstance. You can choose to employ a small amount of iodine for cleaning the kitten’s navel area if it gets inflamed or infected down the road, although unlikely. Finally, if the new mother cannot feed the kittens for whatever reason, be prepared to hand feed with a kitten milk replacer. Get a special formulation that includes colostrum. You will need to feed them with a small dropper for as long as the nursing period lasts – about four weeks of continual feeding and another four weeks for the weaning process. Once she is close to birth, your pregnant cat will be searching out a safe and secluded place to deliver her kittens. Make it easier for her by creating a special nesting place. A simple high-sided cardboard box lined with soft towels, bedding, newspapers, etc. – essentially anything soft and comfortable you don’t mind getting soiled – will be a perfect place for her to nurse. Just make sure that the items you use do not have any strong odors or fragrances. Kittens are born deaf and blind recognizing their mother only by scent. Set up her food and water just outside the nest and place a litter box about two feet away. Ensure that the area you choose is not a high traffic area. It should be tucked away somewhere private where dogs, other pets, and humans frequent less often, if at all. If even after all your special preparations your cat still delivers the kittens somewhere else, let it be. She has her instincts and will follow them regardless of your good intentions. Kittens on the way is a time of celebration. When well prepared, you will be the proud guardians of a few new members of the family delivered safe and sound. When it comes to how to prepare for the birth of kittens, making sure to provide the proper food at the right time for the queen, creating a safe nesting place for her near delivery time, and making sure to have emergency preparations in place will all help to ensure perfect delivery. If you just found your cat is pregnant, reach out to us here at Little Cat Clinic at 619-547-0900 today. We will be happy to give you a roadmap to follow and be here to answer all of your questions. And again, congratulations!